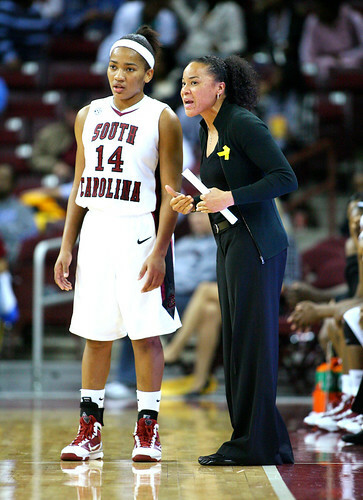 After spending eight seasons at Temple with the women’s basketball team, coach Dawn Staley left for the South Carolina Gamecocks last year. She recruited 2009’s No. 4 class. Courtesy Travis Bell Sideline Carolina Freshman guard Ieasia Walker and former Temple coach Dawn Staley confer during a South Carolina women’s basketball exhibition game the week of Nov. 10. This is Staley’s second year with the team. It was just after the conclusion of the 2007-2008 women’s basketball season, a season in which Staley led the Owls to a 21-13 record and another NCAA Tournament appearance. Staley, who just signed a six-year contract extension the year before, was preparing for another season of improving her legacy on North Broad Street. But things changed as fast as one of Staley’s passes during her playing days. “It all kind of came into play from a personal standpoint and a professional standpoint. My mother is from South Carolina. All of my brothers and sisters still live here,” Staley said. “From a personal standpoint, my mother was ill three years ago. I felt like I’d have a little more help if I brought her down here to South Carolina. I wasn’t looking for a job. South Carolina wasn’t on my radar. I just signed a contract a year before, so I wasn’t looking. I was stable. I was comfortable. “[But] it was the right challenge for me taking the [South Carolina] job,” she added. Staley signed up to become the Gamecocks’ women’s basketball coach on May 10, 2008. “There’s a huge difference, about 1.4 million people different. It’s more laid back. There aren’t a lot of options [of things to do],” Staley said about the differences between South Carolina and Philadelphia. In 2000, Staley came to Temple and rebuilt a program that went 45-93 during Kristen Foley’s five years as coach. Staley said it was a decision she’s glad she accepted. Staley wasn’t afraid to come in and make her presence felt in practice and on the sideline. Her fiery attitude earned her comparisons to former Temple men’s basketball coach and Hall of Famer John Chaney. The comparison went beyond philosophy and demeanor. Like Chaney, Staley put a winning product on the floor. She had an immediate impact in her first season, as Temple finished with a 19-11 record and earned a bid to the National Invitational Tournament. Seven seasons later, Staley put together an impressive legacy. She became the all-time women’s basketball wins leader at Temple with a 172-80 record. In those eight seasons, Staley led the Owls to six NCAA Tournaments, four Atlantic Ten titles and five Big 5 crowns while earning A-10 Coach of the Year honors in 2004 and 2005. In addition, Staley coached two players who were drafted into the WNBA: Candice Dupree (sixth pick overall in 2006 to the Chicago Sky) and Kamesha Hairston (12th pick overall in 2007 to the Connecticut Sun). “I tried to put a product on the floor that people could be proud of,” Staley said. “From coaching young people, you try to instill discipline where they can be successful no matter what they do in life. That’s what I had my eye on. A main ingredient for Staley’s success on the bench was her own impressive playing career. Her success came early, as she was named USA Today’s National High School Player of the Year in 1988 as a senior at Dobbins Tech in Philadelphia. Her career continued at the University of Virginia, where she and the Cavaliers reached the NCAA Final Four three times. The only player in Atlantic Coast Conference history to record more than 2,000 points, 700 rebounds, 700 assists and 400 steals, Staley was a two-time National Player of the Year and thee-time All-American selection. After college, Staley won three Olympic Gold Medals and played in the WNBA from 1999-2006. “Every time you play at a high level you learn how to win. I think it just set the stage for me in the coaching world,” Staley said. Now Staley is trying to set the stage to put South Carolina into contention in the Southeastern Conference. In her first season, the Gamecocks went 10-18 (2-11 SEC), something Staley expected. “It was a difficult season,” she said. “I knew there was a big challenge ahead of me. I thought our players throughout the entire season played hard. Once we establish that we’re hard workers, we can bring in some talent to add to that. Talent is on the way, as Staley welcomes the No. 4-ranked recruiting class led by Kelsey Bone, Ieasia Walker and Ashley Bruner. Like Staley’s teams at Temple, she promises that the Gamecocks will be competitive for all 40 minutes. While winning was a familiar trend for Staley at Virginia, it was her friendship with her replacement at Temple – coach Tonya Cardoza – that she values just as much. Like Staley, Cardoza enjoyed a successful first season at Temple. The Owls finished 21-10 and earned an at-large bid to the NCAA Tournament before losing to Florida in the first round. Early indication is that all parties are winners in Staley’s departure. After 14 years with University of Connecticut Hall of Fame coach Geno Auriemma as an assistant, Cardoza was rewarded with a head coaching job. And Temple continues to win basketball games as, the Owls stand at 5-1 to begin this season. Staley was able to secure her family issues and avoid any distractions as she continues to do what she loves.